For the students enrolled in the DAAD’s development-related postgraduate courses, sustainability is an issue that demands more than just a scientific take. 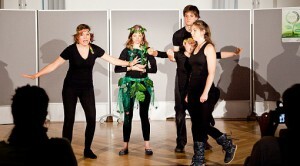 The students in the Master’s programme in Environmental Governance at the University of Freiburg took it to the stage, presenting a play on sustainability. A young woman wrapped in vines and wearing a crown of flowers stands centre stage. She looks out into the audience in both innocence and fear as a man wearing a white shirt and tie talks out her merits: “The Amazon region is home to 20% of the world’s water fresh water reserves, which are just waiting to be bottled and sold! Let the bidding begin…” The auction gets underway but is disrupted by demonstrators, who are taken away and left to show their rage from the street, where they pound on windows from the outside. The Freiburg students presented an unusual play as part of the Right Livelihood College Campus (RLCC) at Bonn’s Center for Development Research (ZEF). Titled “Setting the Stage for Sustainable Consumption”, the play presents one group’s journey toward greater environmental awareness while illustrating society’s ensnarement. Many of the amateur actors on stage come from developing countries and receive funding from the DAAD. 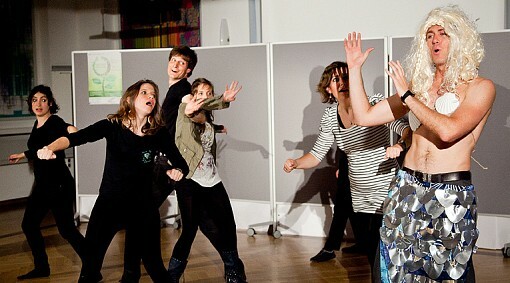 Each year students of the Freiburg programme are responsible for putting on student-organised event. The students select a topic and work on it over the course of two semesters. At the end of the third semester, the result of their work is presented to the public as part of the “Freiburg Forum on Environmental Governance”. Up until this year, the end result was always a scientific conference; the last one was held in February 2011 as part of the Millennium Express programme. The students from the Class of 2012 decided to take an entirely different, more personal, approach: How difficult is it to lead a sustainable lifestyle? A number of students decided to find out and created a documentary film about their experience. The play “Setting the Stage for Sustainable Consumption” was also part of the student project.